Hollywood makes a movie about the moon landing—and omits America. Hollywood has made a movie about an iconic American event, but ditched the icon. It has created a smarmy, dishonest, and dollar-driven perversion of the truth, akin to making a movie about the 1980 Lake Placid Olympics and leaving out a certain hockey game. First Man is director Damien Chazelle’s account of astronaut Neil Armstrong’s arrival on the moon 49 years ago. By all accounts, the film does a magnificent technical job of representing a great voyage of discovery. 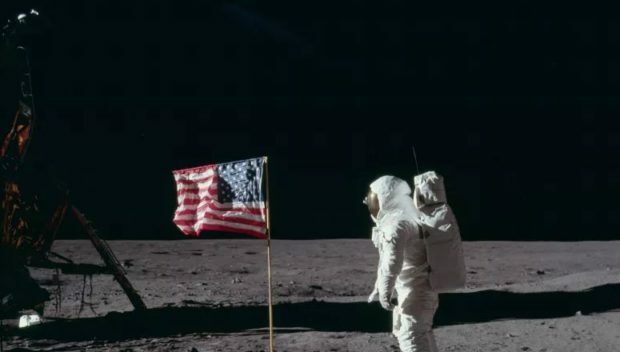 But in this version, Chazelle and his leading man, Ryan Gosling, excise the image that defined the event: that of the American flag, planted firmly on the surface of the moon. It’s an image for the ages—but not for Chazelle and his star.